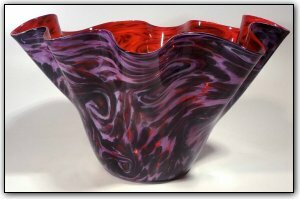 This large fluted bowl features many shades of purples on the exterior and many shades of red on the interior. However, rather than fully separating the exterior and interior colors, they are allowed to show through in spots creating truly spectacular highlights from the inside out and vice-versa. Make sure to zoom in to see how deep and rich the colors are and how they interact and compliment each other in such a lovely way.